So tonight I decided that “Darn gone it! I am going to somehow find time to workout, spend time with my girls and make a healthy dinner.” Now, all of this would need to be done after I got home from work (around 5pm) and before my girls went to bed (around 7:45pm). Well, I worked out…. for a mere 30 minutes. I spent quality time with my girls….I count the time spent in the car. I also made a yummy healthy dinner and it only took about 20 minutes. Which leaves me 10 minutes to write this recipe post. Which, will then leave me just enough time for….uuummm my other half (wink). Whew, a woman’s work is never done. So anyway, this is a recipe without many rules. 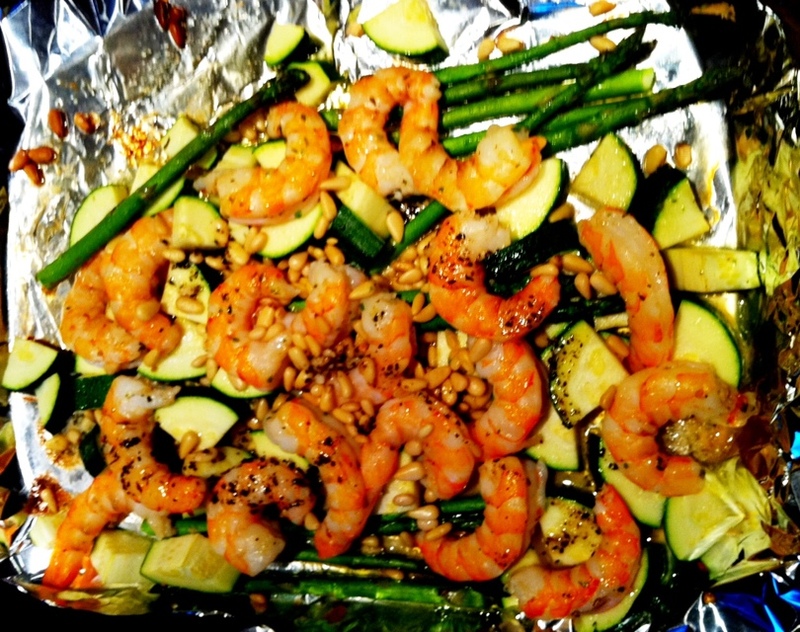 Just veggies, shrimp, a little flavored oil and a dash of seasonings. Now, you will notice that I used the oven to make this dish. I know you are saying “What! It’s 90 degrees outside, I’m not turning only oven”. Well, being able to throw food in the oven is a great way to cook dinner without standing over the stove. Thereby, giving you more time to do something else. Like, practicing sight word flash cards with a 5 year old who’s looking forward to starting Kindergarten in the fall. Or, playing dollies with an almost 2 year who likes to simply rip the clothes off of the dolls, put them back on and then start all over again. I digress, let’s get back to the food. I love this recipe because it’s healthy, tasty and filling. In case you are wondering about the pine nuts, I used them because I like the crunch it gives to the recipe. You can also top this with a little shaved or grated Parmesan cheese for extra flavor. 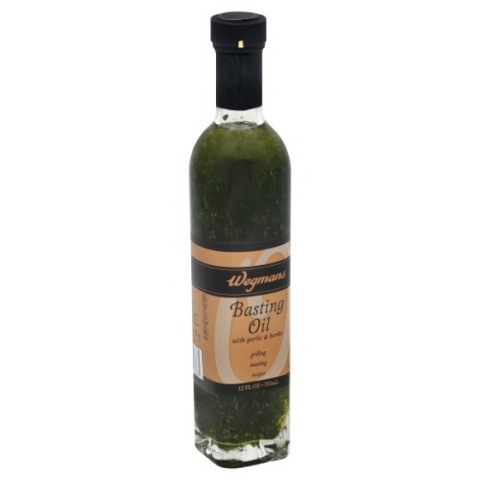 If you live near a Wegmans I would definitely recommend purchasing their Basting Oil. This oil is a great substitute for fresh herbs. I would prefer fresh herbs and the basting oil but if you don’t have the herbs this oil still gives you a great infusion of flavor in your recipe. Place shrimp and cut vegetables in a bowl. Mix in oil and seasonings. Spread mixture in a aluminum foil lined pan. Bake for 7- 10 minutes (depending on size) or until the shrimp turns pink and the flesh is opaque. Stir the shrimp and vegetables so that all the flavors blend together and serve. This dish is great by itself or for a heartier meal add in a side of pasta. Sorry this is the only picture I have of this dish. It was consumed so fast I didn't have time to take pictures of it on the plate. Just like a carpenter needs their tools, every cook should have their arsenal of kitchen favorites. This is one of mine. Look for a future post about all of my favorites.